While many media players seem to have turned their backs on reader comments, or handed them over to Facebook or other third parties, there is also a wave of reinvention happening — with companies like Gawker Media turning their commenters into bloggers, and the New York Times highlighting comments inside their stories. Now Quartz, the business site launched earlier this year by Atlantic Media, is launching a version of reader comments that it calls “annotations,” as a way of trying to capture some of the value its readers can offer. 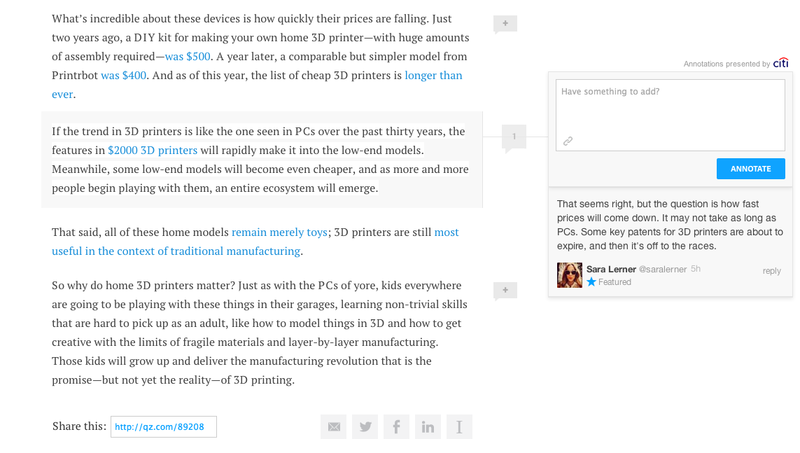 The new Quartz feature positions comments next to specific paragraphs of a story, rather than dumping them all in a comment section at the bottom of a piece. The feature looks and behaves very much like what Medium — the site founded by former Twitter CEO Evan Williams — calls “notes,” and Quartz senior editor Zach Seward said in an interview that this is not a coincidence, and that the site’s annotations were partly inspired by Medium’s feature. A better way of encouraging reader input? So in much the same way as they do on Medium, annotations on Quartz show up beside a paragraph as a small number, which opens up when a reader hovers over it to show the comments that have been added. There is one major difference between the two, however: while Medium’s writers get to pick and choose which notes show up to outside readers, annotations at Quartz show up automatically and then are moderated (by writers and editors) after the fact, Seward said. Writers can also choose to “feature” an annotation, which makes it and its author more prominent than the rest of the comments. Seward said that in addition to Medium, the Quartz feature was inspired by a number of annotation-style developments from around the web — including sites like RapGenius, which started allowing users to add annotations to rap lyrics but has branched out into other forms of content, and annotation features offered by services like SoundCloud and Gawker. Seward also noted that according to RapGenius investor and Netscape founder Marc Andreessen, annotation was originally intended to be part of the first Web browser Mosaic, but was removed because the infrastructure to support it didn’t exist yet.